Headlines: The fishing in the Snowy area just does not get any better at present. Lake Eucumbene is firing in a major way. 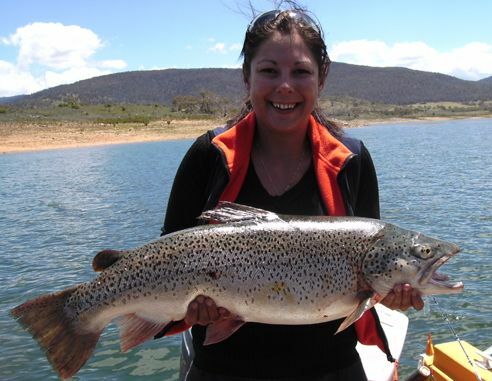 Jindabyne has produced some class fish and a monster! 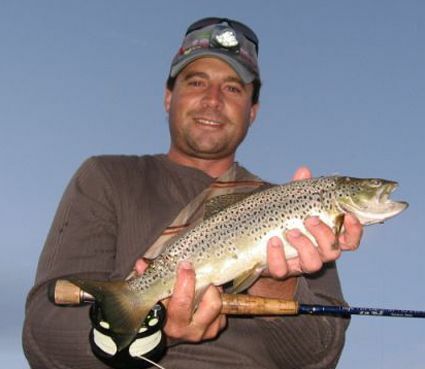 Rivers have had plenty of activity on dry flies and lures. Bait fishing in the lakes has been very good. Wind has been the only downside of late but with patience and persistance you can find still find some areas with a little protection for bank fishing at least. Lake Eucumbene:- The lake is offically firing. With fishing being very good despite some wind and warm days. Reports of great fishing around the edges are still flooding in with literally cricket score catches. Daytime fishing has been spectacular plenty of nice rainbows searching the edges along with a few browns. Midges and caddis have been the main insects hatching but there all sorts of food being taken by the fish. Snails, corixa, damsels, beetles, mudeyes, tadpoles, daphnia and hoppers have all been on the menu. You need to find the areas where the fish are working. They are not everywhere. If you fish an area for more than thirty minutes without a few hits, move on. 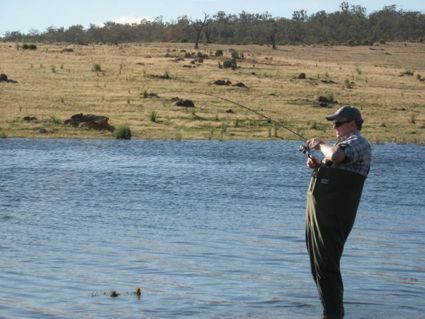 When you find some fish there are usually a few to catch before they wise up or move on. If you stand in the one spot you will catch fish. If you move around a bit you will catch many more. Shallower weedy, grassy soaks have been the best areas along with some of the deeper banks next to the soaks. *I had a daytime Boxing Day sesssion and managed to get nine rainbows to the bank plus missed and dropped a few. All fish on beadhead nymphs in about sz 12 or 14. All fish were rainbows and were released. *Fished again on Saturday with Sturg. Second cast produced a nice fish and that was the start of my best ever session on the lake. Ended up with twenty three for the afternoon and Sturg landed eight. 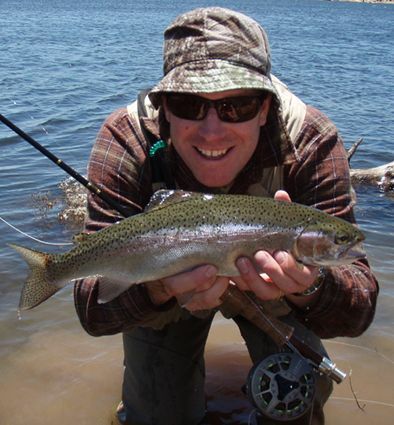 All were rainbows in the 40-50cm size range and full of fight. Nymphs took the majority of the fish with a few on midge balls on dark. Spectacular fishing. *Bushy has been fishing the lake regularly of late and said he has simply lost count of how many fish he has caught on the fly. It really is that good. *Matt, Stuart and young Harry Sturgeon had a good couple of days on the lake with some nice fish landed on the fly. Didn't hear how many they caught but they sent through a couple of photos. We have heard reports of an angler catching 71, 45 and 35 fish in a day and I would believe it. Best lake fishing in ages at the moment. Don't miss out! *Greg fished with the Sturgeon brothers and caught his first ever trout this week. Well done Greg. The fish was caught on the old faithful Celta. 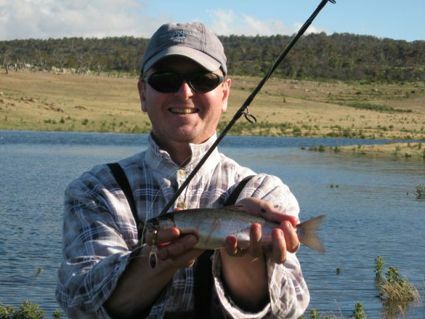 *Mornings have been the best with one angler catching nine in a session, he drove back to Canberra that day realised that the fishing was just too good and headed up again the next morning for another seven fish. *Tracey Blundell has caught on the weekend, what is possibly the biggest fish for the year out of the lake. This magnificent fish weighed 16lb 4oz on the digital scales. Taken trolling a small Strike Pro minnow on leadcore Tracey knew it was a good one but according to father Ray, all legs on the boat went to jelly when it first surfaced. Ray had the rather unenvious task of getting it in the net but did the job well and it was smiles alround. When asked how long the fish took to land Tracey uttered one word. "Ages"! The fish has gone to Skins Alive to be mounted as a life lasting trophy. 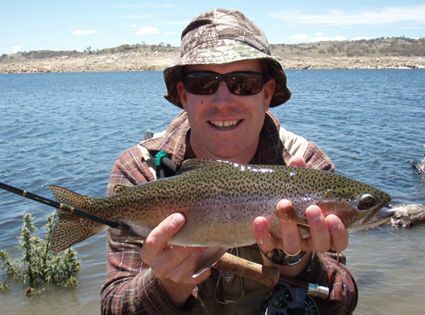 Mudeyes have been a key bait over the last week though Powerbait is still doing exceptionally well in Eucumbene. *As well as catching them on fly, Harry Sturgeon likes pulling them in on the bait rod too. Another great fish that would make even dad jealous. 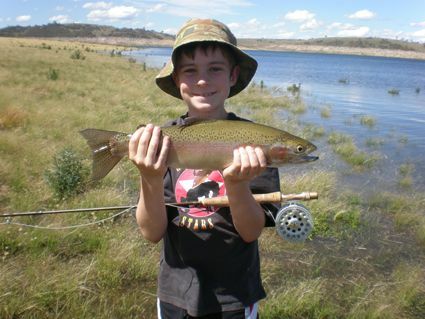 There have been some very good success stories this week out of Eucumbene. Mudeyes continue to be the pick of the baits. Reports of ten fish in a session have been common. Best areas in Eucumbene would be Coppermine, Waiunui, Buckenderra and Seven gates. 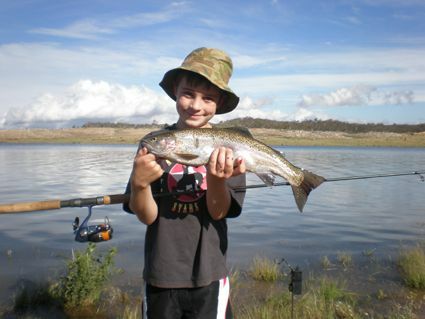 Jindabyne has also been very good with Mudeyes and Scrubworms. Powerbait and Gulp wil produce some good fish during the day.